A little more than a week ago, my dad and I went to Lockhart — known as the “Barbecue Capital of Texas” — and sampled sausage, brisket and ribs at Smitty’s. This past Sunday, my mom took my younger brother back to College Station (I’d taken him back home to Houston after I was done shooting the Texas A&M-Missouri game). I accompanied them, largely because of the promise of dinner at Rudy’s. My dad had sung Rudy’s praises enough for me to ready myself for another meat fest. 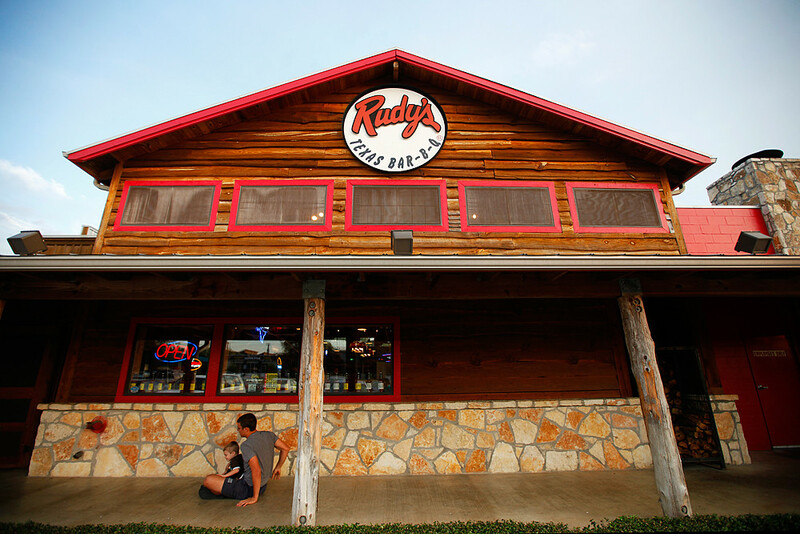 What my dad didn’t know — until I told him the other day — is that Rudy’s is a chain restaurant. Which, inexplicably, is a little disappointing. You’d think, or at least I’d have thought, that you could find the best barbecue only at local, often run-down venues whose proprietors wouldn’t dream of opening another location. But Rudy’s barbecue was pretty good, and their ribs were more tender than the ones we had at Smitty’s. And their “Sissy Sause” was an excellent accompaniment to their meats. 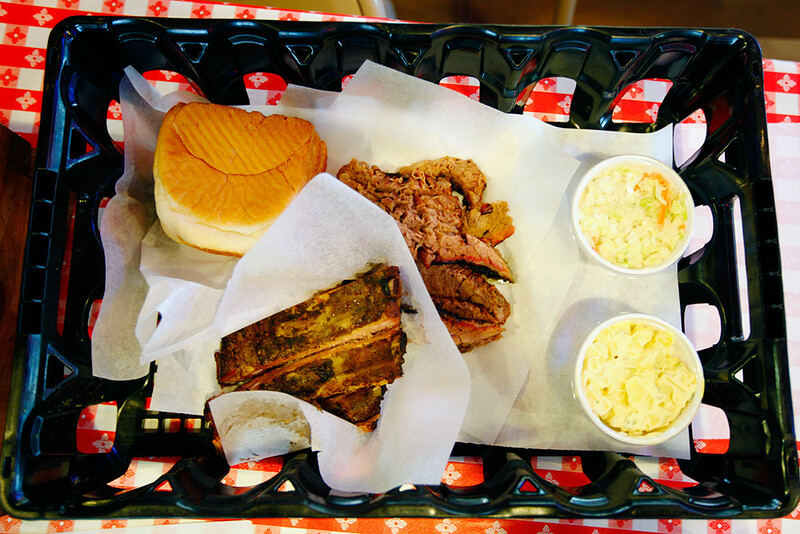 Bread, brisket, ribs and containers of coleslaw and potato salad, served in shallow crates at Rudy's "Country Store" and Bar-B-Q in College Station, Texas. 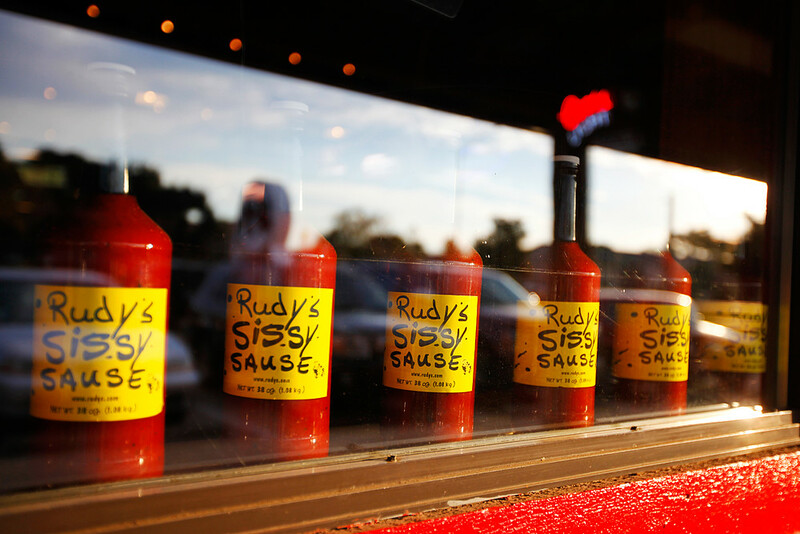 Bottles of "Rudy's Sissy Sause" line the windows of Rudy's "Country Store" and Bar-B-Q on Sunday, Oct. 18, 2010, in College Station, Texas. 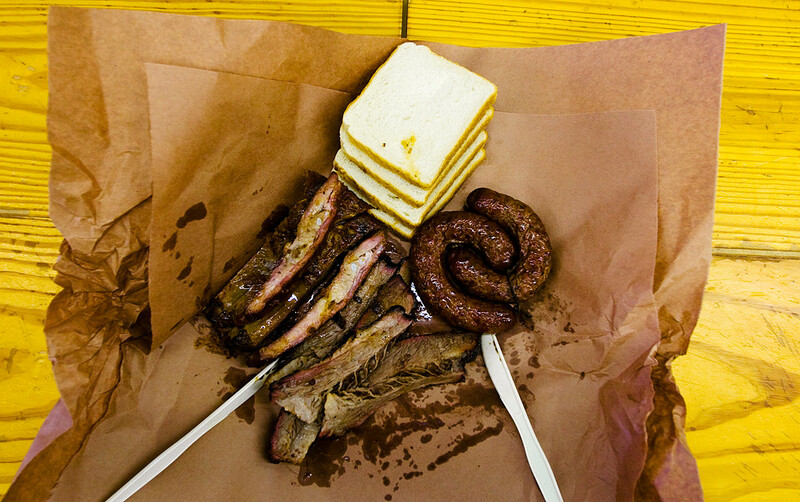 A single rib and a few slivers of brisket were enough to fill me up, even though the only other food I’d had that day was a bagel at 8 a.m. Another meal of Texas barbecue was meat overload — yeah, I’m weak — and I decided to go vegetarian for a few days. That is, until the next night when I saw a piece of leftover chicken marsala in the refrigerator. 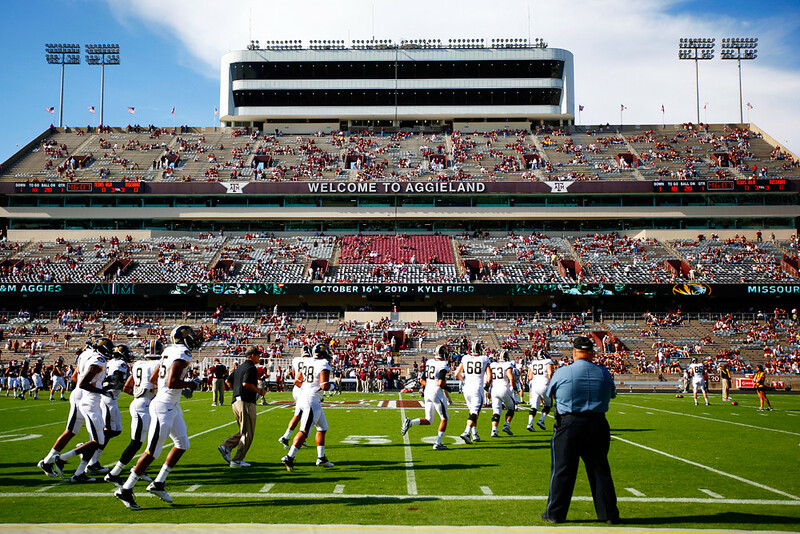 Members of the Missouri football team take the field for some pre-game drills at Kyle Field in College Station on Saturday, Oct. 16, 2010. 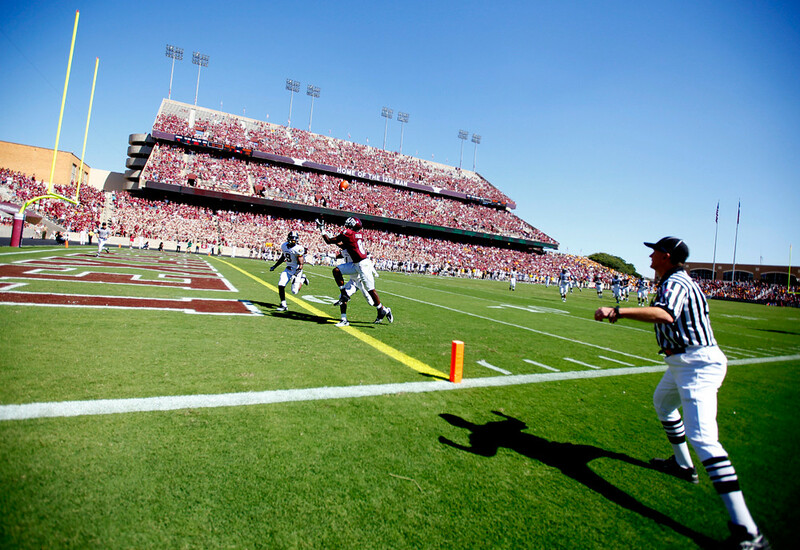 Jeff and I shot Missouri’s game against Texas A&M in College Station on Saturday. It was only my second time on A&M’s campus — my younger brother is a sophomore there — but I was looking forward to witnessing the Aggie spirit. I used my new full-frame camera. Texas A&M junior wide receiver Jeff Fuller catches the ball for A&M's first and only touchdown against Missouri on Saturday, Oct. 16, 2010, at Kyle Field. Note: This photo has been highly sharpened, due to some backfocusing. I didn’t have a lens longer than my 70-200/2.8. Which meant I shot a lot more features than I have ever before at a football game. 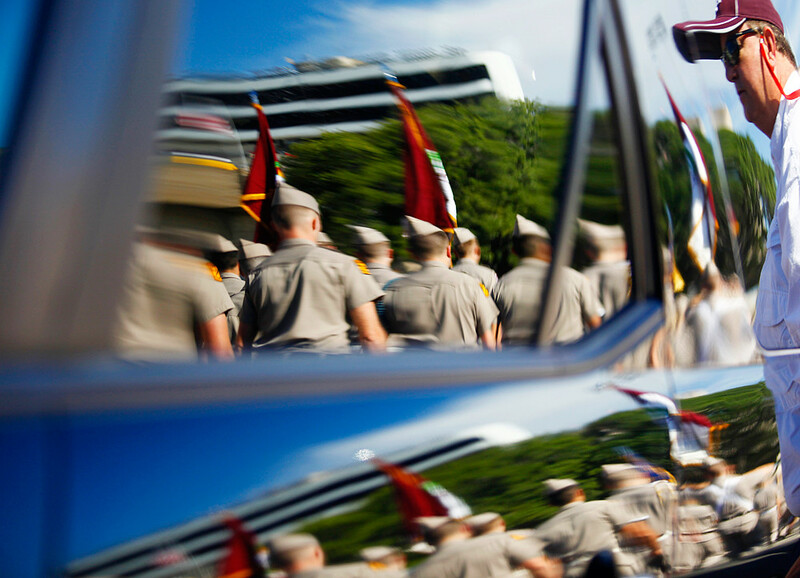 Will Lowe of Houston, right, is reflected on the side of a car as he watches the Texas A&M Corps of Cadets -- the university's student military organization of 2,002 members -- marching to Kyle Field in College Station, Texas, on Saturday, Oct. 16, 2010. Texas A&M is one of five U.S. colleges classified as a senior military college and, apart from the service academies, produces the most military officers of all U.S. schools. 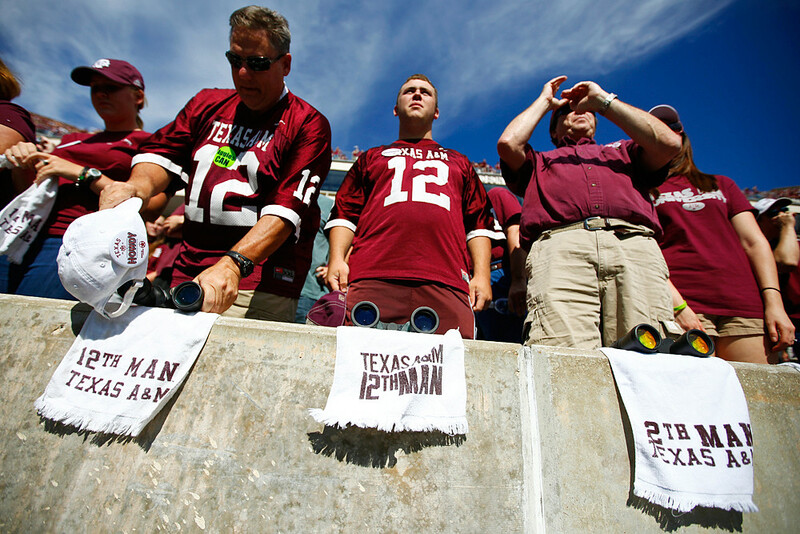 Travis Nault, center, stands ready to sing the Aggie War Hymn as Wendell Nault, left of center, and Kevin Kenefic, right of center, remove their hats before the Texas A&M-Missouri football game at Kyle Field in College Station on Saturday, Oct. 16, 2010. Largely because of all of the above, I had a blast photographing the game — but mostly, the game outside of the game. Last week, I woke up, checked my e-mail and saw I had a message from none other than Mark Luckie. He said he wanted to discuss something with me, offline, and when would be a good time to chat on the phone? A little more than an hour and a 15-minute phone conversation later, I was surprised and honored that Mark asked me to contribute to his blog, 10,000 Words. For those of you who may not be familiar, 10,000 Words has been Mark’s journalism+technology blog for more than three years. Mark, a multimedia journalist who’s now at The Washington Post, has covered just about every topic pertaining to journalism and technology, and the blog has been a tremendous resource for many digital journalists. The day after our phone call, the official news was announced: Mark had sold the blog to Mediabistro. While Mark will continue blogging for a while, other journalists would be brought in to contribute to 10,000 Words. Right now, those contributors are Lauren Rabaino, Ethan Klapper and me. We know we won’t be the only ones, but for now, we’ve been communicating and collaborating, and have established our own niches. I’ll be covering the photo/visual aspects of journalism+technology, to keep true to the spirit of 10,000 Words’ vision. No doubt this will be a challenge — this is my first foray into any kind of tech blogging — but I’m excited. Be sure to check out my first post (about photojournalism portfolios), as well as all the others that will come! And if you have any ideas, suggestions, feedback, etc., I certainly welcome an e-mail or comment. Thanks for reading — and thanks to Mark, Mediabistro and everyone who’s supported and encouraged me as I move forward. © 2010 by The Atlanta Journal-Constitution. (Click on the image above to view the full photo story on my website.) 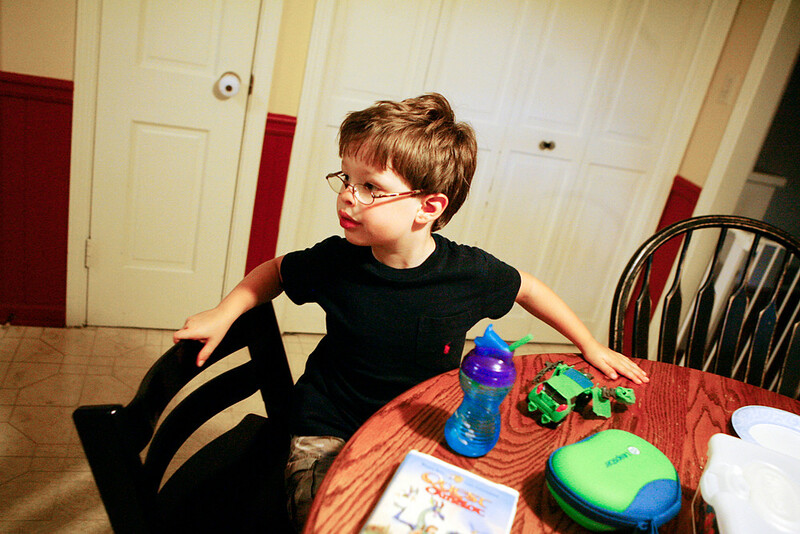 Mason Taylor, 4, at the dinner table on Monday, Aug. 23, 2010. Mason is four years old. Like other boys, he likes playing outside, squabbles with his sister and builds rocketships with blocks. He also has sensory processing disorder, which means he reacts to sensory stimuli differently, and he undergoes therapy to help him cope with these stimuli. © 2010 by The Atlanta Journal-Constitution. (Click on the image above to read the relevant article on ajc.com.) On horseback and standing up in the stirrups, Mason Taylor reaches for a high-up ring during his hippotherapy session with hippotherapist Brent Applegate (right) at Chastain Horse Park on Thursday, Aug. 12, 2010. 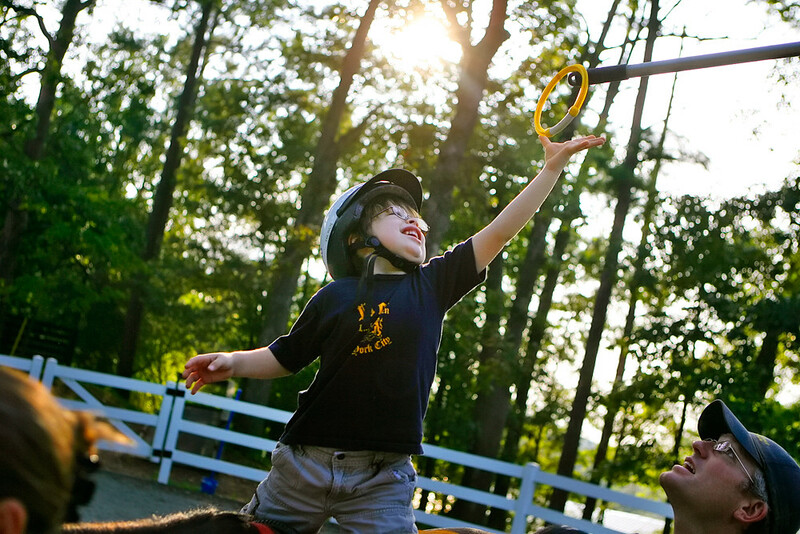 I met Mason one morning during his hippotherapy session at Chastain Horse Park. Having met his therapist Brent on a previous assignment for The Atlanta Journal-Constitution, I had originally thought about working on a story about hippotherapy — but after I met Mason, I wanted to know more about him. Mason’s mother Carol is an occupational therapist, and she was very open and candid about her son and the disorder. She let me follow Mason for another hippotherapy session, and then for an occupational therapy session in their house. On my fourth visit with Mason, I spent the entire day with him — all the way up to bedtime. View the complete picture story on my website. Yes, it’s been about five weeks since I last updated this blog. No, I’m not dead. Rather, I’m back home in Texas. I am available for freelance work, have been working steadily on a few projects and am applying for jobs and internships. Speaking of projects, tomorrow I’ll post a picture story I completed in the last week of my internship in Atlanta — so be on the lookout for that! In the meantime, today my dad and I made a pilgrimage to Lockhart, Texas. Officially “The Barbecue Capital of Texas,” as declared by the state legislature in 2003, Lockhart is a small town south of Austin. It has four barbecue restaurants. We went to Smitty’s. Dad savors the last bite of lunch at Smitty's. Pork ribs, brisket and sausage - and, of course, cheap white bread. What's up with barbecue and cheap white bread? On the trip back, I realized I’m not a big-enough food — or meat, or barbecue — aficionado to be making these kinds of trips. I’m certain many foodies are game for pilgrimages to the meccas of their various food interests, but I’m just not cut out for that. I know when food is bad, but after a point, meat is meat. Barbecue is barbecue. It’s good when it’s good. If one barbecue place is better than another, I wouldn’t know the difference. Shame on me, as a Texan? Maybe.